The history of First Twelve Mile Baptist Church teems with stories that are miraculous, mundane, mysterious, tragic, and triumphant. The story begins when the founders of First Twelve Mile first congregated in December of 1799, at the home of Brother Beuthel Riggs. Records confirm the history of the church predates the Southern Baptist Convention and the Kentucky Baptist Convention, established in 1845 and 1837 respectively. This fledgling House of God underwent several changes as it matured. A fire in 1905 destroyed most church documents. This fire, ignited by a lightning strike, also destroyed the church's sanctuary. That same day, members vowed to construct the fourth and final home of the church. 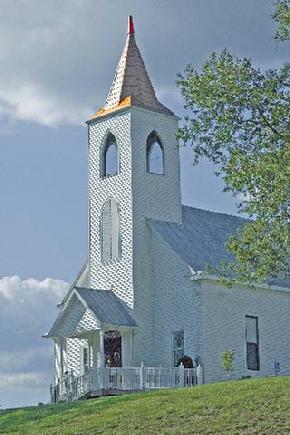 "Before the embers cooled, a new building was started on the same site," according to church documents which also state the congregation completed the new construction in one short month. This same building is the current sanctuary of First Twelve Mile Baptist, 3288 Oneonta Road in California, Kentucky. The beautiful, unadorned white structure and bell tower, we think, reflects the values and convictions of parishioners: commitment to God, their families and their community.